The VUT65 introduces the reliability and quality of SnowDogg to UTV's. It is ideal for campus and grounds crews that need to clear small parking lots and tight walk-ways. It operates very well in tight areas. Additionally, its weight is optimized to be able to work with most full-size UTV's. Designed for High Efficiency:Aggressive flare maximizes the volume of snow that can be moved and a simple, torsional trip edge design allows you to plow very smoothly. Double Acting Cylinders:Give you the ability to perform locked back dragging operations. 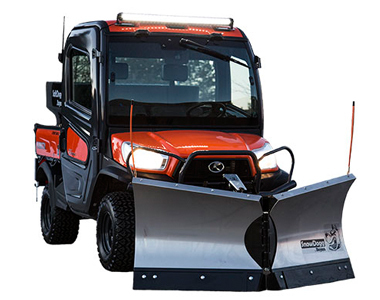 Ask us about the SnowDogg VUT65 78'' UTV V-Plow. Please no repair questions. Your Q&A may be posted to SnowblowersAtJacks.com to help other shoppers, like you, with their purchasing decisions. Thank you. Is the utv included in the $4000 price? Or is that the price of the plow alone? Kristen, this is just the plow. The UTV is not included.